The WC Marketplace Registration Template will allow site admins the flexibility to add more fields to their WC Marketplace plugin registration form with the help of WPUF, which is otherwise limited. 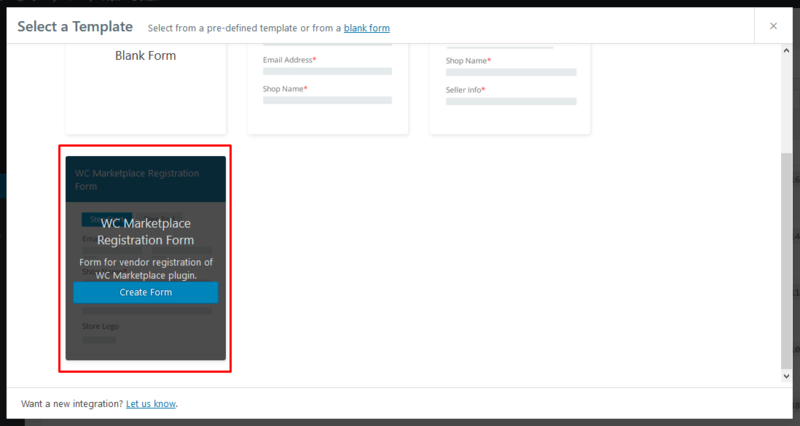 A pre-defined but customizable form template will be available for vendors to register. Vendors registering in WC Marketplace with this form will automatically get assigned as vendors under user roles. Admins can add extra fields as desired. Navigate to wp-dashboard->User Frontend> Registration Forms>Add Form. Click on Add Form. Then select WC Marketplace Registration Form. Click on Create Form to open. This will open up the registration form. From here admin can customize – add or remove fields – as desired. Each registration form will have two shortcodes at the top: Registration and Profile. If you don't want your users to be able to edit the information they enter in the registration forms, only paste the Registration shortcode. If you would like your vendors to update their form, paste both the Registration and Profile shortcodes when publishing. N.B. : Ensure not to change the Meta Key of the existing fields where applicable. You can change the Meta Key of new fields you add. To publish, Save Form and click on the Registration and/or Profile shortcode. Create new page, give it a title, paste the Registration and/or Profile shortcodes. Then click on Publish. This is how your WC Marketplace Registration Form will look from the frontend. When vendors submit the form, they will receive a success message and will automatically be registered as vendor in the WC Vendors user roles.